Tesco supports unacceptable cruelty within their supply chain - forcing chickens to grow so quickly that some aren't even able to stand. According to an independent study, 270 million chickens in the UK have poor locomotion. Open Cages have launched a campaign calling on Tesco to follow other companies in signing the European Chicken Commitment, this will eliminate some of these barbaric practices and improve welfare conditions for their broiler chickens. Broilers are selectively bred to grow unnaturally fast. As a result, their premature bodies cannot handle the weight, which can lead to broken legs, starvation, and heart attacks. If people grew this fast, a 5 year old child would weigh 300 pounds. Broilers are packed often up to 19 chickens in a square metre. This is a little less than an A4 page for one bird, meaning they can barely spread their wings or get any exercise. Skin diseases and burns are typically caused by ammonia fumes, as chickens are living in their own filth: those who have difficulty standing develop nasty blisters. On top of this, bodies of dead animals often lie in farms unattended. Help us Stand With Chickens by signing this petition now, which will send the email under "read petition letter" below to Tesco's CEO, demanding that Tesco sign the European Chicken Commitment and commit to higher welfare standards for their chickens now! The short life of chickens reared for meat in Tesco's intensive factory farms is full of unnecessary suffering. 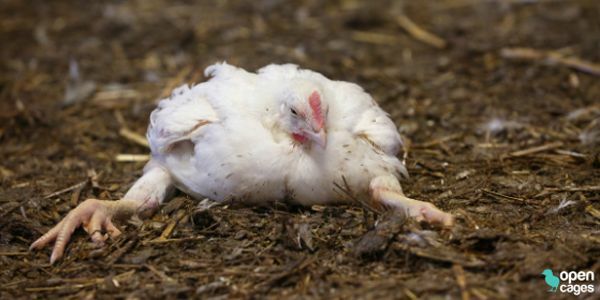 On intensive farms like the ones in your supply chain, chickens have been bred to grow unnaturally fast resulting in many collapsing under their own weight: as a result, mortality is very high. Birds have no larger than an A4 sheet of paper to move around and suffer skin diseases and burns from living in their own filth. I disagree that these sorts of conditions are acceptable and believe Tesco should take action: there are alternatives. Your customers care about the welfare standards of the animals they buy and expect chickens reared for meat to live in better conditions. Tesco must take responsibility for the welfare of the chickens sold in their stores by signing the European Chicken Commitment and taking the necessary steps to ensure conditions improve for these animals.